If you didn't get a chance to join us last time, you have one more chance to Wukkout!® with us on the Coney Island Boardwalk for another edition of "Soca on the Boardwalk." Fitness classes will be lead by Wukkout!® and FitBK and are free and open to the public. Additionally, there will be a Caribbean Carnival headpiece making workshop for the kids and a "Color Me Caribbean Dance Party" with a live DJ. The entire event lasts from 6:30-8:30pm with the Wukkout!® class taking place at approximately 7pm. Bring the whole family and join us as we celebrate all things summer and soca on the boardwalk. Feel free to contact us if you have any questions. We had an amazing time last month and are sure to have a great time once again. Click through the pictures from our last event below. Hope to see you there! Special thank you to Senator Jesse Hamilton, Senator Diane Savino, WIADCA, HCC and MetroPlus Health Plan of NY for making this event possible. Brooklyn, Classes, Carnival, Event, Fitness, FREE, Krista Martins, Soca, Wukkout!®, Wukkout! Summer is officially here and that means Wukkout!® is heading back to the Coney Island Boardwalk for another edition of "Soca on the Boardwalk." Fitness classes will be lead by Wukkout!® and FitBK and are free and open to the public. Additionally, there will be a Caribbean Carnival headpiece making workshop for the kids and a "Color Me Caribbean Dance Party" with a live DJ. The entire event lasts from 6:30-8:30pm with the Wukkout!® class taking place at approximately 7pm. Bring the whole family and join us as we celebrate all things summer and soca on the boardwalk. Feel free to contact us if you have any questions. We have an amazing time every year and are sure to have a great time once again. Hope to see you there! Also, mark your calendars because we will be doing this all again on Friday August 3rd. Details to come soon. 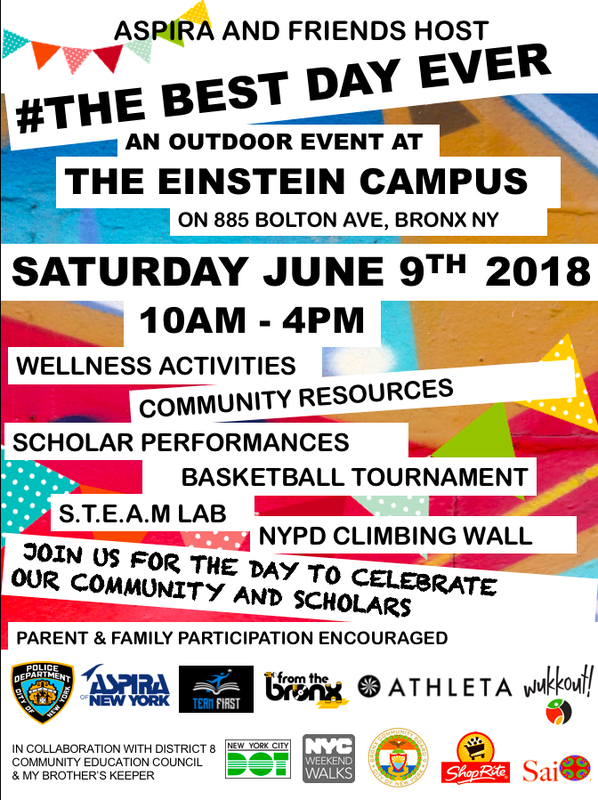 Wukkout!® is excited to be back in the Bronx for a mini demo-class for Aspira of New York and Friends #THEBESTDAYEVER community event. The event is free and open to the public and will feature various wellness activities, resources and performances. Further details below. See you all in the BX! It is the month of love and what better way to celebrate than to show yourself a little? Join Wukkout!® Founder and Athleta Ambassador, Krista Martins, alongside Influencer RaVal Davis, for a Vision Board Workshop designed to focus on your 2018 self-care goals. We believe that showing yourself love is vital to thriving in all areas of your life so we've put together an afternoon to inspire your self-care journey. Along with the workshop, Health Coach Stacy will be on hand to provide you with shoulder massages using essential oils. Additionally, she will be bringing some of her delicious, healthy, chocolate ice cream. 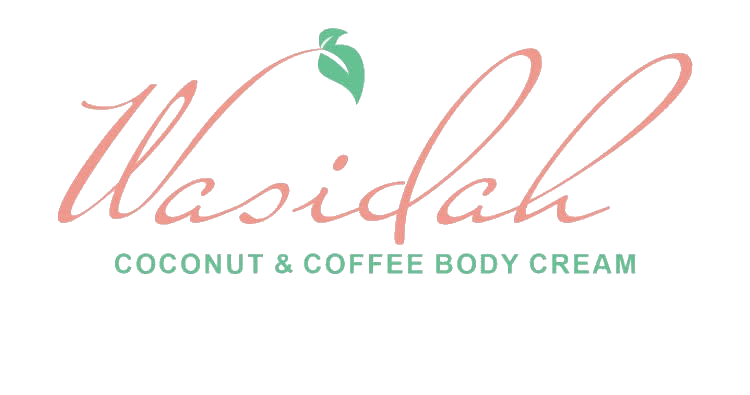 Wasidah Francois will also be back to provide hand massages with her Wasidah Coconut & Coffee Body Cream and Scrub. 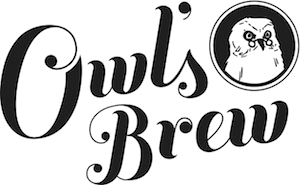 Finally, Owl's Brew will be providing us with refreshing, tea based beers. Grab your girls and treat yourself to an afternoon of a little self-love. You deserve it. RSVP at the link below (simply search for the date and time and click "sign up now"). What to Bring: 2 or 3 magazines if you're participating in the vision board workshop. We'll provide the rest. Click through below to see photos from our Vision Board Workshop this past December. Weekly Classes are Coming to Queens! It's been a long time coming but weekly Wukkout!® classes are heading to Queens! Join Wukkout!® Instructor, Ariana, at the South Ozone Park Library, for FREE ongoing classes beginning Monday February 5th. The class time is 6pm and no pre-registration is required. Click here to get a taste of what class with Ariana will be like and see details below. Ariana Carthan here a.k.a. JOY. I'm a school counselor and a full-time lover of Soca music. I can always count on Soca to put me in the best of moods. That's why Wukkout!® is the best class to teach. I can spread my JOY of the music and assist others with their fitness goals. Come get on bad because you know your bumper is too real and the only thing left to do is party to the full extreme! See you in class. 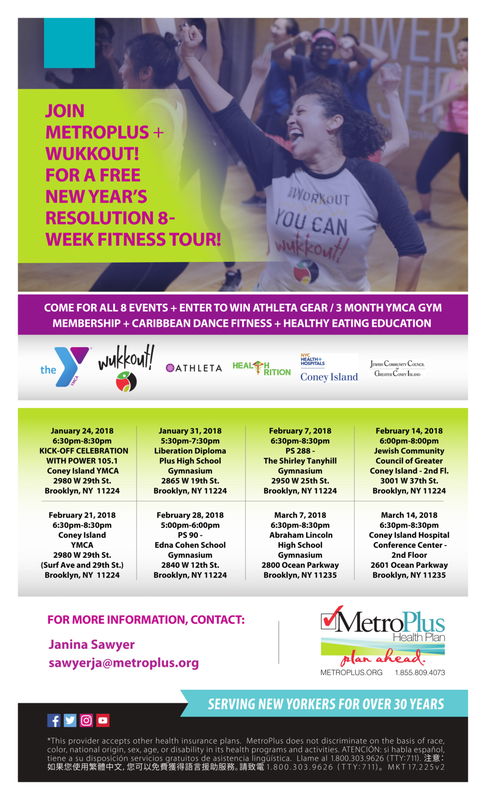 Join Wukkout!® & MetroPlus Health Plan for a Free 8 Week Fitness Tour! Wukkout!® is teaming up with MetroPlus Health Plan of NY and the Coney Island Hospital to help you crush your 2018 fitness goals. Join us for a FREE, 8 week fitness "tour" of South Brooklyn. At each stop you will be able to participate in a Wukkout!® class with one of our #teamwukkout instructors as well as receive healthy eating education from our nutritionist on site, Healthtrition. We want to keep you moving and keep you motivated so for anyone who attends all 8 classes, you will be entered into a raffle to win a shop card for a new exercise outfit from Athleta Flatiron in NYC or a 3 month membership from the Coney Island YMCA. We're kicking it all off with a celebration this Wednesday January 24th at the Coney Island YMCA from 6:30-8:30pm. Power 105.1 FM will be on site to provide us with music AND the Coney Island YMCA is generously raffling off another 3 month membership to one lucky winner out of everyone who participates in the Wukkout!® class that begins at 7:30pm. The class is free and open to the public (you do not have to be a YMCA member to attend) so tell a friend to tell a friend and come jump and wave with us! Details for the kick-off celebration as well as the remaining 7 classes can be found below. As a reminder, all events are free and open to the public so grab your friends and kick off your healthy living goals together. Feel free to contact us with any questions and see you in class! Wukkout!® with us for the Grand Opening of the Flatbush Caton Market! We are excited to be partnering with the Flatbush Caton Market to celebrate the Grand Opening of their new location! Join us as we celebrate Caribbean food, Caribbean culture and most importantly, Caribbean community. There will be face painting, hair braiding and carnival crown making for the kids, along with plenty of food, shopping and of course Wukkout!® for the adults. Join Wukkout!® Instructor, Allie (pictured right), for two free classes, taking place at 4pm and 6pm. Come for one or stay for both but definitely bring yuh flag and a friend! All details are below. Feel free to contact us with any questions and see you at the market! 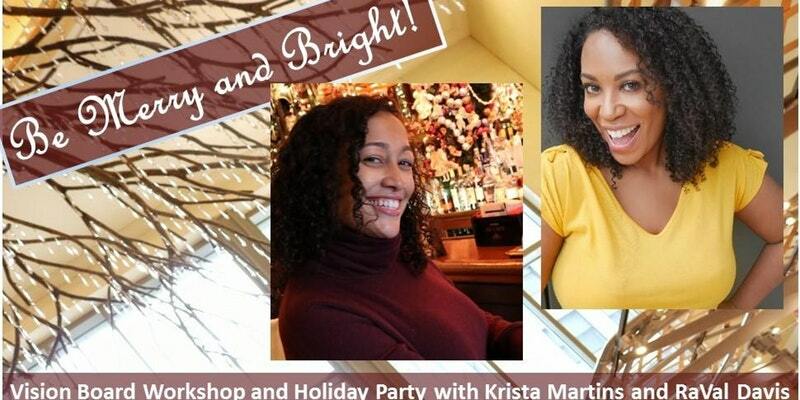 Join us for a Vision Board Workshop & Holiday Party at Athleta! 2018 is right around the corner and we want to get you ready. 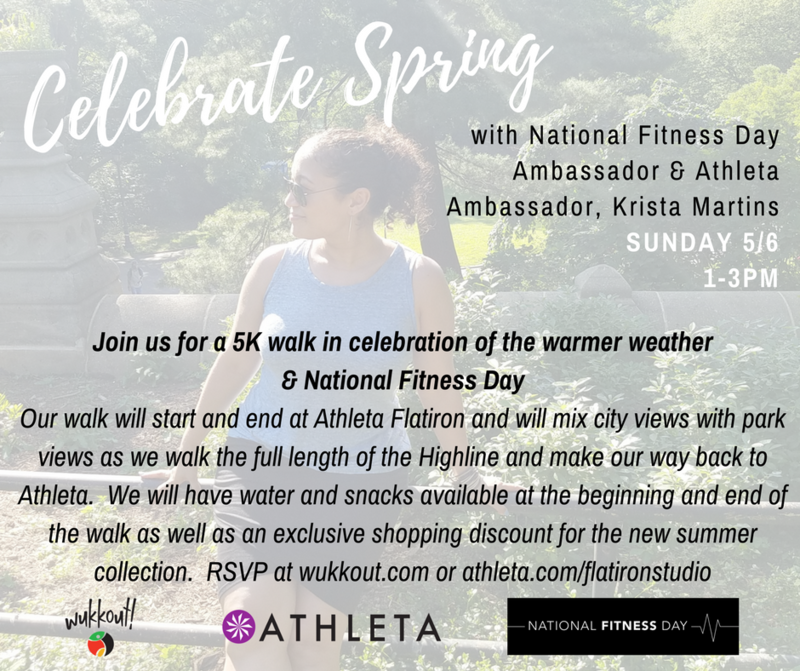 Join Wukkout!® Founder and Athleta Brand Ambassador, Krista Martins, alongside Influencer RaVal Davis, for a Vision Board* Workshop designed to inspire your goals for the new year. After the workshop, stay to network and sip on specialty tea based cocktails compliments of Owl's Brew, nibble on holiday treats,** and check out our #teamwukkout live window display! Additionally, all workshop participants will be entered to win a holiday gift from Athleta. Grab your girls and come be merry with us! Details below. Join us for "Metro Moves," a free fitness and lifestyle event, this Friday September 22nd in Coney Island! The event is being presented by MetroPlus Health Plan of NY and will take place outdoors in Kaiser Park. A variety of dance, strength and cardio workouts will be held from 5-8pm including classes lead by Buster Skrine of the NY Jets, Coach Kenya, EyeCycleNYC and of course a Wukkout!® class lead by Founder, Krista Martins. The Wukkout!® class is scheduled to begin at 5pm so be sure to get there early! We had a great time at the last event so you definitely won't want to miss this. This is a community event and is free and open to the public; tell a friend to tell a friend and we'll see you on Friday!